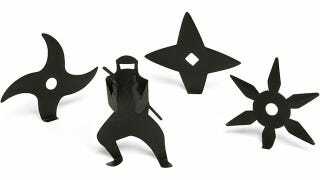 I love everything about these ninja-inspired throwing star sticky notes from ThinkGeek. Everything except the fact they're made from black paper, making them next to impossible to write on with anything other than a special marker. Available in three styles of throwing stars plus a bona-fide ninja ready to do combat, the notes appear to be only sticky in strategic spots, letting you stick them in a way that makes them appear to be lodged in the surface.